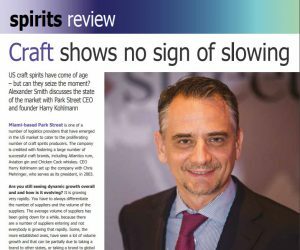 Park Street Companies was recently featured in the International Wine and Spirits Research (IWSR) Magazine, recognized for its innovative platform tailored to support the needs of emerging craft spirits brands. CEO and Co-Founder of Park Street, Harry Kohlmann, discusses the rapidly evolving beverage alcohol industry and what we can expect from the expanding market. The craft spirits industry is arguably one of the fastest growing sectors of beverage alcohol. This rapid growth appears to be in response to changing consumer trends. Dr. Kohlmann highlights the cycle of supply and demand as millennial consumers explore their options and consider specially crafted brands over the bigger names, generating increased market fragmentation and the opportunity for smaller brands to appeal to an evolved consumer. In reciprocation, entrepreneurs are flocking to the craft spirits industry, either developing their own private label brands or partnering with contract producers. The trend is not expected to slow in the foreseeable future, especially as craft whiskeys continue to age.